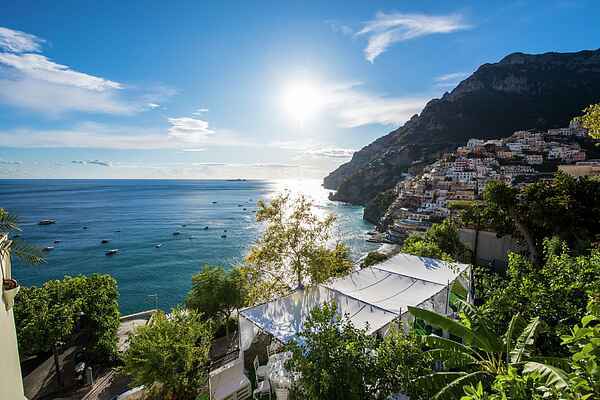 Villa Dominick is a beautiful holiday home on the Amalfi coast in Positano. The villa is a 10-minute walk from Piazza dei Mulini and from the main beach in Positano. Opposite the villa is the hotel of the house owner. You can use the swimming pool, panoramic restaurant, spa and gym of this hotel. The villa has been completely renovated and the interior is elegant and stylish. There are three bedrooms and three bathrooms. In the garden there is garden furniture and a jacuzzi. From the living room and the bedrooms you have a beautiful view over the sea. You can also enjoy a view of Positano from the garden. Near the villa is the famous hiking trail, il sentieri degli Dei. This 11 km walk with breathtaking views over the Amalfi Coast is a truly unforgettable experience! Positano is a chic and picturesque resort with Moorish-style architecture and steep slopes with houses. With the boat you can reach Capri, Ischia and the cave Grotta dello Smeraldo. The city is known worldwide for its beauty and romance. There are parking spaces at the hotel (25 euro/day).